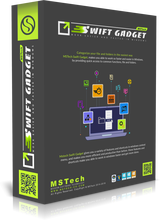 MSTech Swift Gadget is one of the most useful extensions (Windows Tool Pack). Have The Functionality of More than 10 Software in One. It gives you everything you need to keep your computer always organized. Have quick access to your most frequently used Folders, Files and Software, quick search and access to your music, videos, picture and … , auto-categorize your files and pictures, and lots of useful features. This handy and useful software helps you to get more done with less efforts. The Giveaway Promotion Details: - No Free Update - No Free Upgrade - No Free Support - No Commercial Use SPECIAL OFFER FOR GOTD: Buy MSTech Swift Gadget v2.1.0.0 + FREE UPGRADE to v3.0 + FOR 2PCs - 55% OFF ($20). One Day Only. iVoicesoft Giveaway offer MSTech Swift Gadget 2.2.4 for free download. MSTech Swift Gadget 2.2.4 may be only available to FREE download in published day, 13 Apr 2019. Next day, we will offer new Giveaway. Check it now!